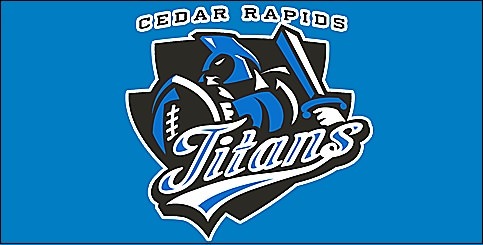 CEDAR RAPIDS, IA - The Cedar Rapids Titans are about to get a new name and a new look. After hinting at a re-branding in a letter late last week on the team's website, general manager Ryan Eucker confirmed the identity change on today in an article in The Gazette. The Titans were sold last month by Chris Kokalis to Roy Choi and Matt Stone. The new owners and general manager are looking to give the team a fresh start as the team embarks on its eighth Indoor Football League season in 2019. Fan involvement will be the driving force in the re-brand. Fans will have the opportunity to submit new team names through September 5. A decision will be made on September 14. The new logo and colors will be announced about five weeks after that. Fans may submit new names here: Name the Team. Eucker is no stranger to re-branding an IFL team. As general manager of the Spokane Shock of the Arena Football League, he oversaw the overhaul of that organization when it made the jump to the IFL (the AFL owned the Shock trademark, forcing the change). Eucker led the re-brand effort, changing to the Spokane Empire. He was brought on by Choi and Stone shortly after they purchased the Titans after a stint as vice president of ticket sales for the independent Minor League baseball team, the Normal Cornbelters, located in central Illinois. "New direction of the franchise is an important thing,” Eucker told Douglas Miles of The Gazette. “Certainly, when (owners) Roy (Choi) and Matt (Stone) came in to take over the organization and saw the changes and the updates that they wanted to make, I think it became apparent to them — despite the team’s past in terms of on the field success and being here in the community — they wanted to give it a fresh start. That’s going to help out a lot when you have the opportunity to rename the team and certainly allow fans to get involved in that process, as well." Fans will have the opportunity to submit three name entries and three color schemes. Per the team's official site: "The fan who submits the first and original entry that is selected as the new team name will receive a prize pack that includes: one (1) authentic 2019 team jersey, four logo t-shirts, four logo hats, four lower level sideline season tickets, and the opportunity to join the team for a 2019 regular season road game against a conference rival." Submissions will be evaluated by a panel of team ownership, team staff, season ticket holders and community representatives. Submissions also will be examined by legal staff to verify that any trademarks and copyrights meet legal availability requirements. In addition to announcing the re-brand, Eucker said the team's coaching search has been narrowed down to four head coaching candidates, all of whom have been interviewed. He, Choi and Stone will discuss the candidates and look to have a decision announced on September 24. He also is working at filling front office positions. The team will post "viable submissions" on it's website, updating periodically. I really like this idea. Getting fans involved is a great move. Ryan leading the re-brand is a terrific idea since he's done it before. I have a feeling it's going to go really smoothly. I'm excited to see what they come up with.